Andile Jali whose full name is Andile Ernest Jali is a South African footballer that used to play for K.V. Oostende in the Belgian Pro League and currently plays for Mamelodi Sundowns and the South African men national team. He was born on the 10th of April 1990 in Matatiele, Eastern Cape of South Africa. As of 2019, he is 29 years old. Andile Jali is married to a reality show star and fitness trainer Nonhle Ndala. Together they have twins who were born in June 2017 named Andile Junior and Amarè. He began his career at the National First Division side Pretoria University and then moved to Soweto giants Orlando Pirates in the year 2009. He was a member of the Orlando Pirates squad that made history in South African football by winning the treble in one season then coached by Ruud Krol. The same team went on to defend their trophies making it a back to back treble. He was part of the South African squad at the 2009 FIFA U-20 World Cup that was held in Egypt. 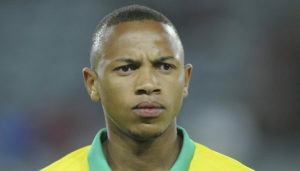 In 2010, Jali was named in the preliminary 30-man South African squad for the 2010 FIFA World Cup but narrowly missed out on the 23-man squad because of a mild heart condition. Jali signed for Belgian Pro League team K.V. Oostende in January 2014. During his second year at the club in 2015/16 season, Jali was impressive helping guide Oostende to a 5th place finish in the Belgian Pro League. We do not have full Information about his earnings or salary at his club and it will be updated whenever we do.